Congratulations to our four 2018 Paul Harris Fellows honored at a banquet on June 9th. Each honoree has gone above and beyond in providing services, supporting their communities and rallying others to contribute to worthy causes. The impact of their actions has been felt locally and around the world. Pictured are (l-r) Rotarian Scott Kaupin, who introduced Paul Harris recipients Murray and Priscilla Brayson from the Enfield Loaves & Fishes Soup Kitchen; Enfield Rotary Club President Carol Bohnet, holding a certificate of appreciation from the Soup Kitchen; Rotary Foundation Chair Ed Palomba; Paul Harris honoree William Lee, former Town Councilman and Deputy Mayor with State Representative and Rotarian Greg Stokes, his introducer; Paul Harris recipient and Rotarian Jo Ann Walk, Enfield’s State Farm Agent and Boston Rotarian Jennifer Smith, her introducer. 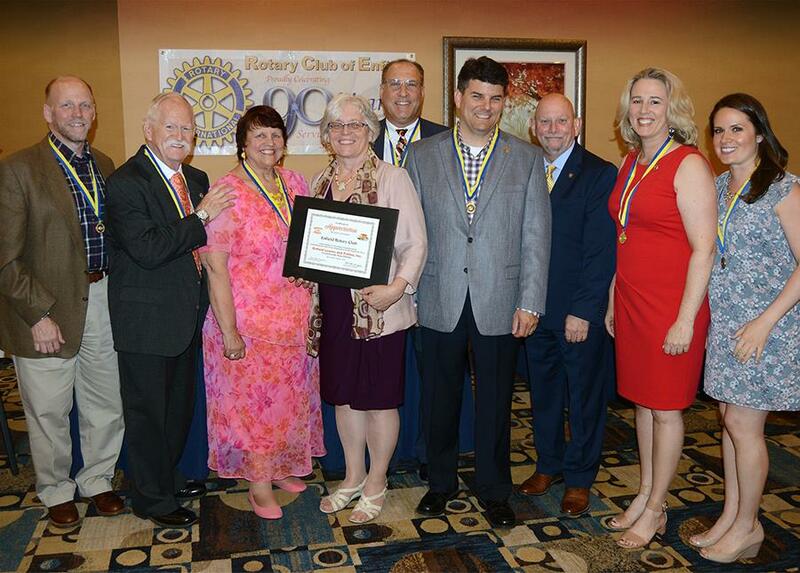 The Enfield Rotary Club donates $1,000 in the name of each Paul Harris Fellow to the Rotary Foundation. The Foundation supports worldwide service projects that promote peace, fight disease, provide clean water, save mothers and children, fight illiteracy and grow local economies. The fellowships are named for the founder of Rotary, which now comprises more than 1.2 million members in 35,000+ clubs around the world. The Enfield Rotary Club meets at noon on Wednesdays at the Holiday Inn of Enfield-Springfield. Visitors are always welcome. For more information about Rotary International, visit www.rotary.org.